Pleasing to the look and touch, this living room table adds a rich contrast to the softer edge of your sofa and armchair. 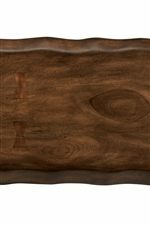 Cozy, rustic, and subtly modern, this coffee table features a textural, log-cut shape carved from solid acacia wood. An aged walnut wood finish and raw steel metal color add to the cozy, handmade appearance. 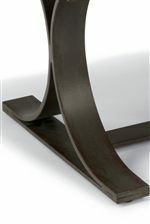 The Farrier Rustic Log-Cut Square Cocktail Table with Dark Metal Base by Flexsteel at Jordan's Home Furnishings in the New Minas, Halifax, and Canning, Nova Scotia area. Product availability may vary. Contact us for the most current availability on this product. Emulating the rustic appearance of live edge wood, Farrier tables were carved from solid acacia wood and shaped into a log-cut, textural outline. 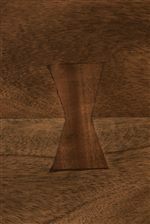 The solid acacia wood was then joined to a hand-forged iron base with unique, butterfly key joinery, adding a touch of Arts and Crafts appeal. The Farrier cocktail table, sofa table, and accent lamp table feature an aged walnut wood finish and dark, raw steel metal finish for a look that matches perfectly with the newest wave of urban rustic and industrial room decor fashions. The Farrier collection is a great option if you are looking for Contemporary Mission furniture in the New Minas, Halifax, and Canning, Nova Scotia area. Browse other items in the Farrier collection from Jordan's Home Furnishings in the New Minas, Halifax, and Canning, Nova Scotia area.